Trimix blending and planning tools that can be used where you are and when you need them. You can use these tools to plan your mixes prior to arriving at the dive shop or to fill your cylinder at the air station or on the boat. 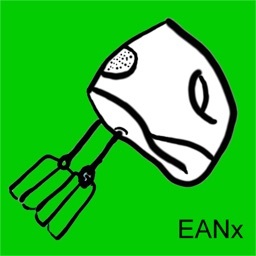 Calculations are provided for the best Trimix given a planned depth and a desired maximum partial pressure of oxygen and equivalent narcotic depth (END). 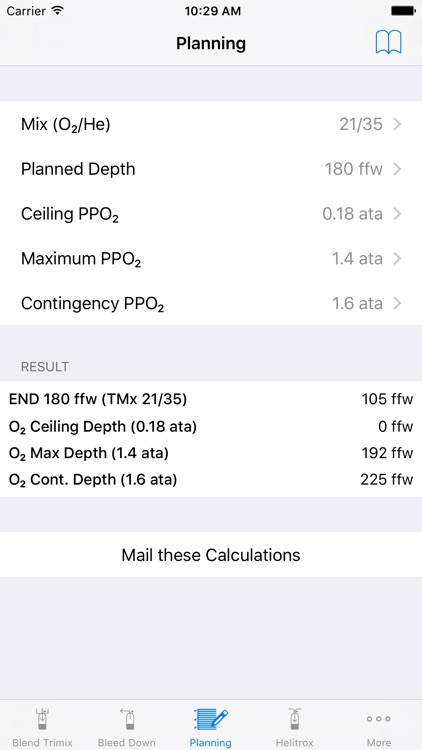 You can also calculate the ceiling and maximum depths along with your END based on your planned mix. 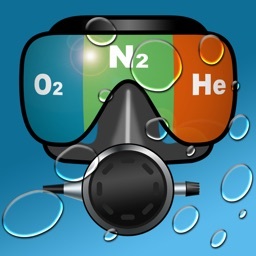 The dive planning tools support both salt water and fresh water calculations. The blending tools provide for filling a cylinder with a remaining mix (or empty) to a specified target mix using oxygen, helium and a topping mix (air or another available mix). 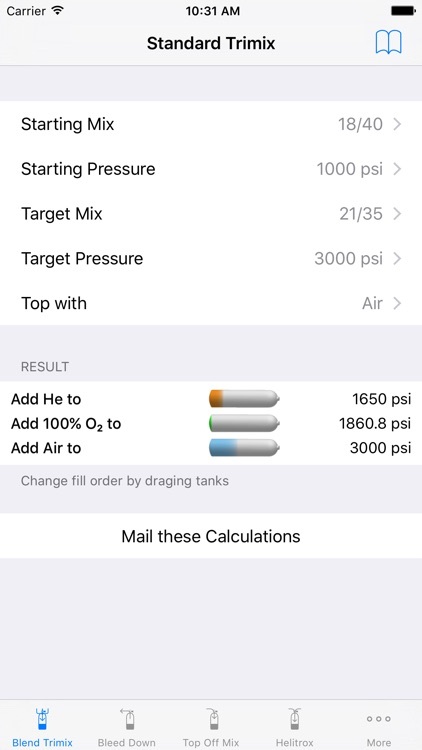 You can also calculate the result of topping an existing partially filled cylinder with a specific topping mix (air or another available mix). 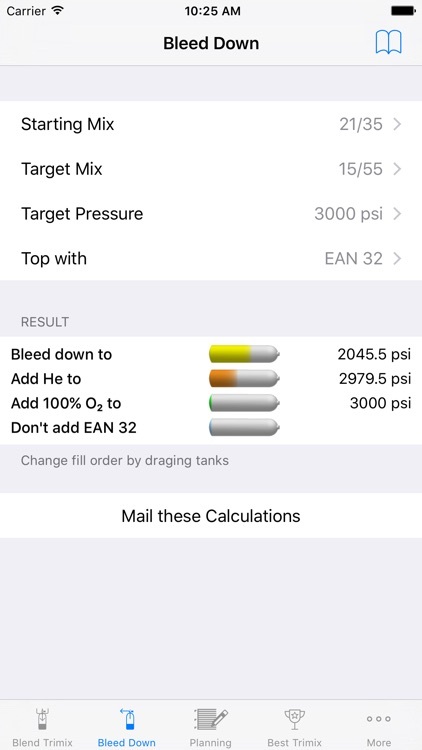 There is also a Bleed Down calculator that allows you adjust an existing fully cylinder to a new mix with minimal wasted gas. Trimix Tools supports calculations in both metric and Imperial/US systems of measure. Traveling on a boat or working out of network range? These tools are at hand any time you have your iPhone or iPod touch. You could, for example, easily calculate the result of topping your cylinder from your first dive with air from the boat's compressor to take advantage of any remaining mix. You also have the convenience of saved settings that you can recall at a touch and adjust to a new situation as needed. Chances are you regularly work with a specific set of mixes and and common dive situations. 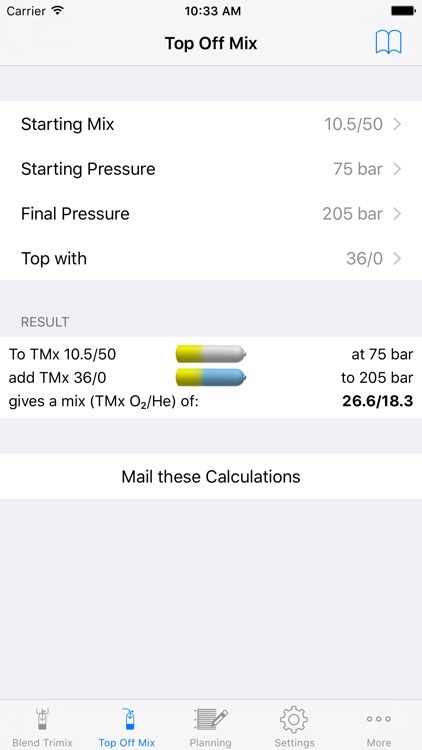 Trimix Tools includes the convenience of saved settings that you can recall at a touch and adjust to a new situation as needed. You can also select mix values using pre-installed default mixes or your own saved custom mixes. You simply tap the "Mixes" button when you are setting a mix to see a list of saved mixes that you can use directly by tapping on them. You can save the current mix displayed on the mix picker wheels by tapping the "+" button. Just like with the saved calculations, you can re-arrange or delete any mixes in your saved list. 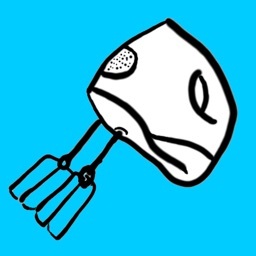 Do you need to share your planning or blending calculations with other divers? 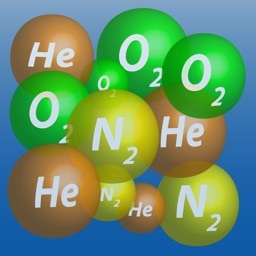 All the tools have the ability to e-mail the results of the calculations from within the application or using the iPhones built in Mail application (depending on the platform software version). 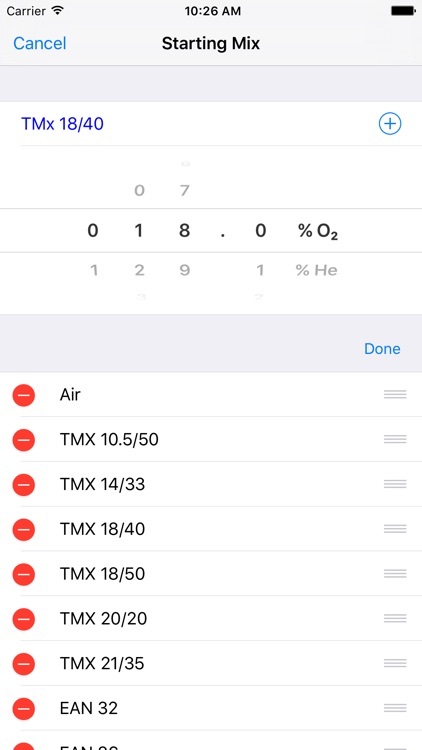 You can enter the addresses and subject directly when composing the message or set default initial values in Trimix Tool's settings tab that will be automatically added. 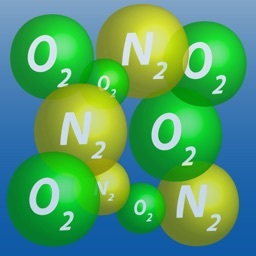 All END calculations (Dive Planning and Best Trimix tabs) in Trimix Tools treat oxygen as a narcotic gas by default. 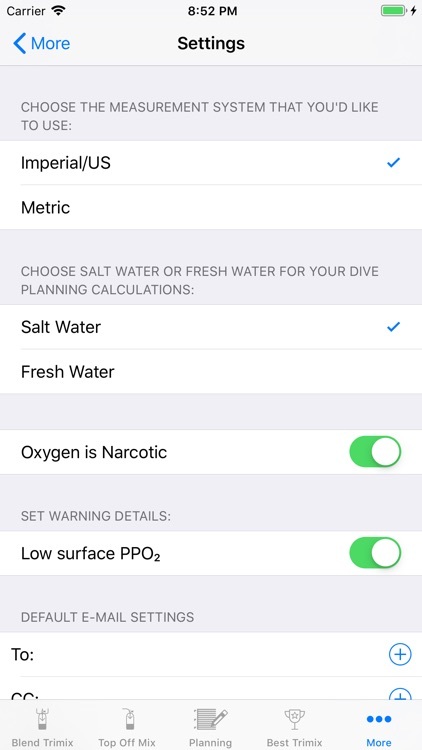 There is an option available under the Settings tab to change the default so that oxygen is not treated as narcotic if that is your preference. Remember you must always personally analyze your mix before diving it. This application is not a substitute for proper training and should not be used as a substitute for proper dive planning or the primary Trimix blending and planning methods taught during training. Please do not attempt to handle high pressure oxygen or fill SCUBA cylinders without proper training.